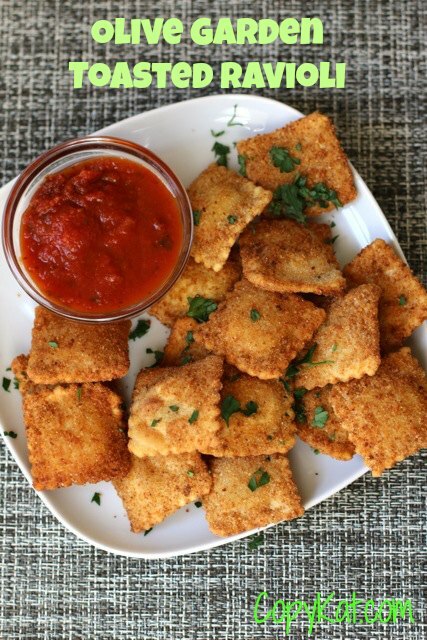 Home » Appetizers » Olive Garden Toasted Ravioli – with our recipe you can make these at home. Olive Garden Toasted Ravioli – with our recipe you can make these at home. Olive Garden Toasted Ravioli is a dish that is loved by so many people. You can make these easily at home by using a package of ravioli. We like to use other types of ravioli for this dish. We have found this to be a great appetizer for you to make for a party, it is inexpensive, and it makes you look like you went all out for the occasion. I love making this dish. I have to say it is one of my favorite dishes to bring to a party, and best of all the Olive Garden toasted ravioli is very simple to make. You won’t be having to spend hours in the kitchen on this one. I simply purchase a package of store-bought ravioli to make this recipe. In just a few moments you will soon have a dish that you will be proud of. 1. Sprinkle Parmesan on top before serving. 3. Serve with left over homemade spaghetti sauce. 4. Serve with homemade pesto sauce. Don’t miss out on preparing this simple to make an appetizer that everyone will love. You are going to love the toasted ravioli even more when you make it at home. Mix water with eggs and beat well; set aside. Mix Italian seasonings and garlic salt with the bread crumbs and set aside. Measure flour in bowl and set aside. Heat vegetable oil in deep fryer or skillet to 350 degrees for deep frying. Dip ravioli in flour, then in the egg wash, then in bread crumbs and carefully place in hot oil. Fry until golden. Remove from oil and drain. Serve with your favorite marinara sauce.You can find more Olive Garden Recipes at CopyKat.com, the web's most popular destination for copycat restaurant recipes. To bake do you just place on baking sheet and go for it? The alfredo sauce link isn’t working. ???? I love your recipes! I’m so glad I found your site! Thank you for sharing!! They do cook very quickly. I hope you enjoy these. Going to try this recipe, it looks similar to mine! I place mine on a cookie sheet over a thin layer of seasoned tomato sauce and a thin layer of seasoned tomato sauce on top and spread mozzarella cheese on them and bake on 350 until cheese has melted. Served with cheesy garlic bread… So delicious!! I’m curious if you fried these first or skipped that stepped then just baked? I made these with Trader Joes refrigerated/ “fresh” ravioli and served with homemade sauce. Yum! Great idea. I love Trader Joes! Do they stay warm long or do u serv at room temp if u bring to party? I have served them somewhere between warm and room temperature. They work out pretty well. My husbands favorite – thanks Stephanie! we sprinkle our with parmesan cheese! a family favorite for sure!! Those sound delicious. I am going to try sprinkling them with parmesan cheese next time too. I love making these. They are so easy and perfect for a party! Stephanie, this recipe sounds amazing! Now I just need to find gluten free ravioli! I bet there is some gluten free products out there that will work well. Thank you Amy for sharing that there are Gluten Free Ravioli! I knew there had to make some out there. I sprinkled a little extra garlic salt to the ravioli as I got them out of the fryer. It added a little extra flavor. Make sure you don’t over fry them because they burn easily! That’s a great idea. I tend to think that its hard to have too much garlic. Need Olive Garden’s spaghetti carbanarro (sp) recipe asap!